My Apple Watch has arrived, an early gift from my wife, and I cannot be more pleased with the device. It was inevitable that I would get one, especially in an era where smartwatches are becoming commonplace due in no small part to the success and uptake by society of wearables. We have devices we can wear on our body to track movement, exercise, track location, and numerous activities. It's amazing how far the simple wristwatch has come in the past century (for those that never looked into it, I highly recommend looking up why we gravitated from pocket-watches to wristlets/wristwatches). In any event, after my initial visit to the Apple Store with my wife several weeks back, I knew this was a new tool I wanted. As I said earlier, it just felt right, and there were so many features I felt I would love. Don't get me wrong, I love my smartphone, and I know I cannot replace that (at least at this current time with technological developments) and that the Apple Watch won't replace everything, but I can already tell a difference. So what did I do with the device today? Well, the first thing was I took it on a run with my wife. I got to test the workout app, which I loved I could set the calorie limit I wanted to burn and be notified when I reached by goal by a simple haptic buzz. We then went shopping, and I used the device to check off items we needed to buy. I then came home and set up more apps that I had been considering (which I will get to), and just really played with it in general. I then played a bit on the Xbox (Destiny if you are wondering), and was reminded several times to get up and walk around, which was a neat feature to remind me to take a break. So there were several apps I was really excited to try out and experiment as I waited for my Apple Watch to arrive. This has been my most anticipated app in all honesty. The reason is primarily due to my Postural Tachycardia Syndome (POTS) which I try to monitor. I tend to measure my HR with Withings Healthmate via the iPhone camera, and while I found it relatively accurate, I would find it cumbersome at times and really only tracked my HR a few times a day. When I checked it, tended to be when I felt 'off' and not during regular periods, so I felt that I was giving myself a false impression of my daily range. That being the case, I had seriously considered investing in a continous HR monitor (e.g. Polar band) or another smartwatch. However, once I learned Apple was releasing a watch with a HR monitor, I knew I had to have it. Honestly, I love that I can now see my continous range, and I have a feeling it will help me monitor myself better. I am a habitual email checker, and constantly find myself whipping out my phone to see if I got any new emails or alerts. 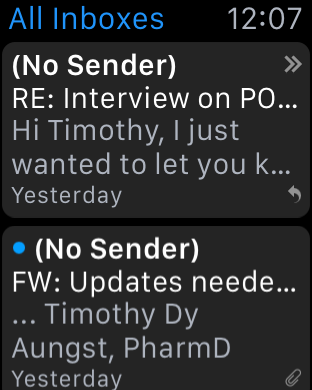 The email app on the Apple Watch is pretty easy to use, and I like that I can scroll through emails relatively quickly to see what I need to address. That being the case, I basically see if anything pertinent comes through prior to using my phone to address the email now. I love Wunderlist, and use it alot in my daily life. I use it to keep track of tasks related to my daily work and personal life. This includes projects, or even shopping lists with my wife. Unfortunately, I feel that he Apple Watch app is relatively limited, as it does not allow me to see different lists, and really only items focused on myself. I feel this is a limitation, and one I am hoping gets addressed in the near future. Like Twitter? So do I! I actually find the native Twitter App rather limited, and downloaded Twitterrific, due to it having a nice feature to seeing pertinent 'at a glance' features to see what my tweets are doing. Overall, I may make the dive into the in-app purchases to allow push notifications, which I feel may be a better use than the Twitter app itself. I am a habitual time tracker. I like to see what I am doing throughout the day, and then see how I am spending my time. I have used other apps, but Hours is the first I have seen that allows me to activate my hour trackers on the Apple Watch, and so far I feel it is making a worthwhile use of my time. I will probably review this one in more detail later on. I use Squarespace as my choice online blogging tool, and I like to keep track of what my articles and content is doing daily. So, I was happy to see they released an Apple Watch app which is pretty similar to the iPhone app. The data is very similar and easy to read, and compressible for my utility. Overall, quite happy with this one. Overall, my initial impressions have been sound. I activated the watch in the afternoon, and it came at 75% battery life, and as I write this article 8 hours later, it is at 50%. My earlier concerns on battery life seem to have been not a big problem and that has really pleased me. However, I will have to see after a long-term use if it stands up to daily usage. I also need to test a few other apps. I really want to find a good task manager app. I will probably play with Clear, Things, and ToDoist and see if any of those make me happier than Wunderlist. Lastly, I am looking forward to more third party apps coming to the market. I really want to use this as a productivity tool, and based on my early impressions with some of the apps I use, I think this may be a great timesaver. I noticed that I really have not played with my phone alot since I got the watch, and this was not a conscious decision. I quickly realized I used to just look at my watch for updates, and rarely actually used it to do actions. So in my mind, the Apple Watch is so far living up to what I wanted it to do: save time and reduce my constant phone monitoring. It's really hand to have this thing around. Can We Engage Patients During the 15min Wait at the Pharmacy?